Don't you think it is weird that we recognize instantly anything ancient Egyptian? Whether it is Cleopatra, the pyramids, mummies, its colorful art, hieroglyphs or symbols, there is nothing like the mystique of ancient Egypt. Archeologists and Egyptologists admit that there are many more mysteries remaining hidden than discovered when it comes to the ancient world of the Egyptians. Their magical and extraordinary system of representing concepts, myths and ideas is beyond words. For the Egyptians, these three disciplines were very closely related, and one cannot be learned without studying the other two. They performed elaborate magical rituals to ask the gods for symbolisms that they can use in expressing their scientific knowledge. Artifacts and ancient literature would suggest that the ancient Egyptians established mystery schools. These schools provided instructions on magic and other spiritual arts, including the art and science of symbolism. The people of ancient Egypt embedded their scientific and esoteric studies in symbols. It was through symbols that they passed on their most important knowledge in science, the workings of the gods, their truths and beliefs, such as the macrocosm and microcosm. These highly observant people were deeply involved in exploring the energy principle of the physical world. They believed that the sun's power of heat is inexhaustible and can be harnessed indefinitely. They called this eternal flow of sun energy Maat. 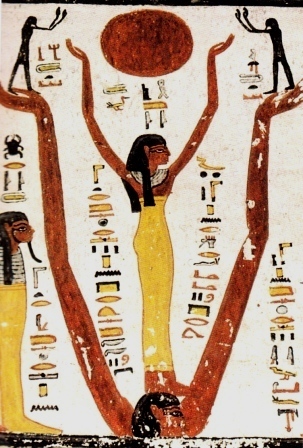 Being natural visualizers, the ancient Egyptians thought in terms of symbols and images. They relied on symbols to lend power to their religious ceremonies and to protect their people, land and livelihood. Religious and magical ceremonies ensured peace and harmony to prevail, especially through their king or pharaoh. The pharaoh's main role is as an interceder, to communicate to the gods what would be best for the people. On the dark side, the Egyptians also used charms, curses, spells and wax figurines to manipulate a hated person's fate. Amulets were designed to inflict bad luck against enemies. They may insert nail clippings or hair in mudballs to cast a curse against the person they despised. The typical home in long-ago Egypt was bedecked with statuettes of gods and goddesses as well as their images. The Egyptian was usually wearing an amulet, wand and charms that bestowed protection and luck. 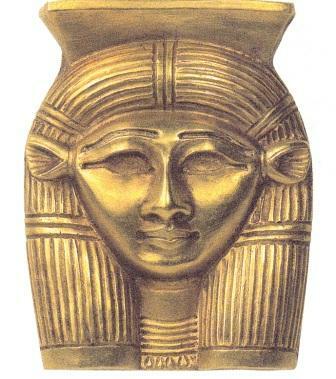 His amulet may contain rolled papyri with spells of protection, or such an amulet in gold below, which is the head of the goddess Hathor. An amulet of Hathor was expected to bring happiness, good news, fertility, good luck, love and protection from harm. Priests, midwives, physicians and charm crafters could all be counted on to prescribe spells and rituals. That is so cool, isn't it? Imagine going to a doctor who will give you a spell or a charm for your migraine:-) Magic or heka was a common, everyday activity back then. It is in keeping with the ancient people's belief that every action is inherently divine. It is uncanny that today, scientists are proving that intention, sounds, symbols and mantras, like the spells used by the Egyptians, have a positive healing effect in the body. They foresee doctors in the near future as prescribing sounds or mantras in lieu of harmful drugs as a faster and more economical means of healing. There is this wonderful website on Egyptian mythology. If you would like to know more of its rich culture, you can read it here. Ready to learn more about the magical Egyptian symbols and their meanings? Click this way! OR find out more about the Egyptian hieroglyphs, Mummification, and the Pyramids.